From left: CMES Pre-K teacher Vicki Strope and CMES Title I teacher Dana Zambito. The American Electric Power Teacher Vision Grant program combines a teacher’s talents and creativity with the power company’s resources and desire to help make a difference in students’ lives. AEP doesn’t want the lack of funding to stand between teachers and a classroom adventure with students. Any project that has an academic focus and a goal to improve student achievement is considered. 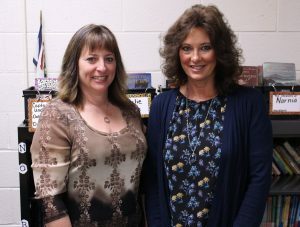 Center McMechen Elementary School teachers Vicki Strope and Dana Zambito have been chosen as recipients of American Electric Power’s Teacher Vision Grant. Strope’s objective is to have Pre-K students learn STEM (Science, Technology, Engineering and Math) concepts through play. She will use the $125 grant to buy a big screen microscope, Smithsonian animal cubes and several STEM kits for her classroom. STEM supports children’s overall academic growth, develops early critical thinking and reasoning skills and enhances later interest in STEM study and careers. Project Plant and Paint is what Zambito wants to put her $250 grant toward. This is an art-based literacy program that connects science and writing. The project’s purpose is to increase student motivation and engagement in literacy while gaining knowledge about the parts of a flower and the planting process. Soil, growing containers, seeds, watercolor paint sets, paint brushes and watercolor paper will be purchased her students to use.